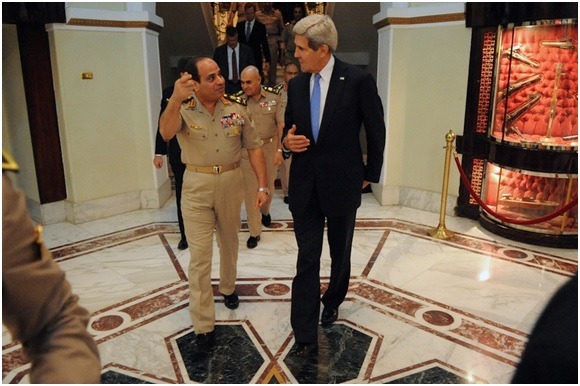 President Sisi of Egypt with John Kerry of the U.S. I have underlined certain comments that I thought were particularly telling. Democracy is not the answer to the barbarity and bloodshed in the Middle East! Christ alone will bring peace to the region—when He returns to this earth. Always remember: First of all, God has the ability to exercise total power and total control over nations and individuals. “Behold, the nations are as a drop in a bucket, and are counted as the small dust on the balance; look, He lifts up the isles as a very little thing…. It is He who sits above the circle of the earth, and its inhabitants are like grasshoppers, who stretches out the heavens like a curtain, and spreads them out like a tent to dwell in. He brings the princes to nothing; He makes the judges of the earth useless” (Isaiah 40:15, 22–23). The prophet Daniel described how Nebuchadnezzar, king of one of the most remarkable empires of all time, became insane and was driven out of office “in order that the living may know that the Most High rules in the kingdom of men, gives it to whomever He will, and sets over it the lowest of men” (Daniel 4:17). God determines who will govern in the various nations, placing in office, sometimes, the basest of men. Reality can be harsh. In order for the United States to weaken and eventually defeat the Islamic State in Syria and Iraq, it could use help from both the Iranian regime and that of President Bashar al Assad in Syria. In the Middle East, it takes illiberal forces to defeat an even more illiberal force. The mullahs’ Iran and al Assad’s Syria sadly represent the material at hand, with which the United States must somehow work or tolerate, however surreptitiously, however much it will deny it at the same time. Ah, you might say, What about the moderate, liberal opposition in Syria? Answer: Such forces are more viable on paper than on the battlefield. The truth is understood but cannot always be admitted, either by officials or by journalists — the truth being that order is preferable to disorder, meaning dictatorship is preferable to chaos, even if dictatorship itself has often been the root cause of such chaos. The Islamic State is the fruit of chaos. It arose in a vacuum of authority. That vacuum was created by both the weakening of an absolutist (albeit secular-trending) regime in Syria and the inability of a stable, power-sharing system to take hold in Iraq following America’s dismantling of Saddam Hussein’s own repressive rule. And the worse the chaos, the more extreme will be the reaction. Thus, from the conflicts in Syria and Iraq that together have killed many hundreds of thousands of people and have featured a plethora of armed groups, the Islamic State has emerged in all its horrifying barbarity. This harsh moral and political reality extends beyond Syria and Iraq to the larger Levant and the Middle East. Egypt is now, once again, governed by an illiberal, Pharaonic regime, worse arguably than that of the deposed military dictator Hosni Mubarak. It has killed many demonstrators in the streets. It features a budding personality cult around its president, Abdel Fattah al-Sisi. Yet it is a friend of Western and Israeli interests, whereas the democratically-elected government it illegally deposed, that of the Muslim Brotherhood, was demonstrably not a friend of the West or Israel. That’s right, Western interests can sometimes — often, actually — be better served by autocracies than by democracies: that’s if the autocracy in question happens to be more liberal and secular in its values than the democracy in question. It is the regime’s philosophical values that are crucial — more so than the manner of how it came to power. As the situation now stands, if there is going to be a less violent relationship between Israel and Gaza it is more likely to occur through the auspices of the al-Sisi regime in Cairo than through the Obama administration in Washington. It might not even be an exaggeration to say that the Israeli government, for the moment at least, trusts al-Sisi more than it trusts U.S. President Barack Obama. Though Obama might like to think of himself as a realist, the fact is that a President Richard Nixon or a President George H. W. Bush — and their secretaries of state, Henry Kissinger and James Baker III — would have openly acknowledged their friendship with the current Egyptian regime, while Obama and his secretary of state, John Kerry, cannot quite bring themselves to do it. Oman is a great friend of the United States. Sultan Qaboos bin Said al Said has quietly provided temporary basing support and logistics for American wars in Afghanistan and Iraq and has been among the United States’ most avid diplomatic allies in the region. He rules in a liberal fashion. But he is an absolute dictator. Morocco, like Oman, has always been among America’s most dependable friends in the Middle East. King Mohamed VI has been moving in the direction of a constitutional monarchy. But Morocco remains stable and dependable precisely because power ultimately rests with the monarch; thorough democracy could undo the country. But isn’t it autocracy, too, that has led to such chaos? Yes, but that does not necessarily mean that democracy is viable in the current circumstances. To say that there is no other choice but democracy is to assume there is an immediate solution to every problem, whereas there may not be. The Israelis know all of this. Therefore, nothing of what I say is shocking or even surprising to them. Indeed, over the decades they have embraced Arab autocrats through back channels. The Israelis have actually feared popular upheavals in the Arab world, aware that Arab autocrats are more likely to be less anti-Western and less anti-Israel than the man in the street. The fight for sheer physical survival is clarifying and dissipates illusions.